It seems that two unvaccinated teens were there while infectious. The Indiana State Department of Health has confirmed two cases of measles, with two more suspected. And this comes as worldwide measles cases are on the rise. Think about this for a moment. You have a place where thousands of people, from many different cities, are all milling together and a virus that infects about 90% of those with whom the host comes in contact. Transmission is much more readily achieved indoors than outside, due to poorer air circulation. The virus can linger in an area for up to about two hours, remaining infectious even after the host has gone elsewhere. Outdoors, breezes can disperse any viral material pretty quickly, significantly lowering the odds that one could get infected. However, if you cram a lot of people in limited space such that they're passing very close to each other, there is an opportunity for the virus to infect others. Imagine that you are one of the public health officials that discover this. Think of the task ahead of you: you have known measles patients that could have potentially spread the disease to thousands of people. Those people have all since returned home to their own states (or even countries). Tracking everyone down would cost way, way too much, so the best you can do is to alert the various state departments of health and put out public warnings that anyone who was at the Super Bowl and who is at risk for infection (i.e., never had measles and/or never received the MMR) should consult their physician. Now, in the interest of truthfulness, I need to point out that, so far, the reasons the two teens were not immunized has not been reported. They may have had legitimate medical contraindications to the vaccine. My gut, though, tells me that we have a couple cases of vaccine refusal. This whole mess could end up very, very badly, depending on how many of the people at the Super Bowl Village were immune, either from previous infection or immunization. MMR uptake rates in the U.S. are, generally speaking, pretty high, but that has been on the decline recently, leaving more people vulnerable to infection. Anyone who was vulnerable and who came in contact with one of the infected could be the focal point of another outbreak in another city, especially due to the efforts of anti-vaccine activists who, despite protesting otherwise, aim to scare people away from vaccines. New measles cases could pop up anytime in the next couple weeks. And if they do, then people in those areas will need to be vigilant for another couple of weeks, waiting and hoping that no more arise. The virus is most infectious before the characteristic rash appears, so those infected may not even realize they are sick. If you were at the Super Bowl and are unsure whether or not you are immune to measles, call your doctor and see what, if any, steps you should take to protect yourself and those around you. Do not just walk into the doctor's office, since, if you are contagious, you may spread the disease to others in the waiting room; calling ahead can help ensure proper procedures are in place to minimize the risk to other patients. If you are sick, stay home. 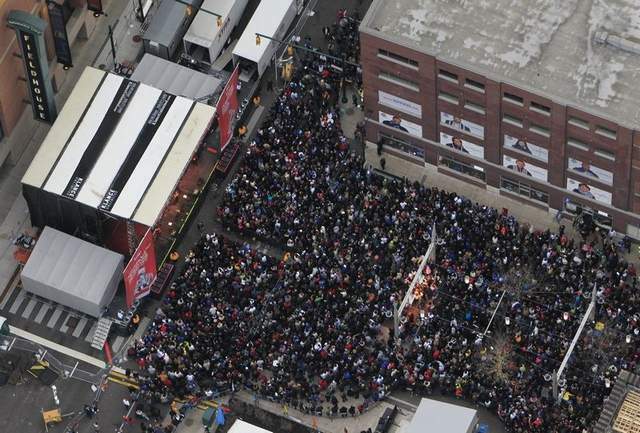 The Super Bowl Village may have been just a few blocks of a large city, but we're all part of the larger human village. It is our responsibility to watch out for each other. "The Super Bowl Village may have been just a few blocks of a large city, but we're all part of the larger human village. It is our responsibility to watch out for each other." Good stuff... Right on point. Usually, health departments will want to do a contact tracing, but, given the number of people that attended, it's just nuts to try to do something like that. Great post, Todd. It will give health care workers (and others) a chance to see what measles looks like. I particularly like "It is our responsibility to watch out for each other."